A vegetarian stuffed Cabbage rolls with a dal and onion filling. 1. Soak the cabbage leaves in hot water for 2 minutes and dip them in cold water. 3. Grind all the filling ingredients, without adding water, to a fine coarse consistency (like rava/sooji). 4. Heat oil for tempering. 5. Fry the mustard seeds and cumin seeds for a minute. 6. Add the onions and saute for 2 to 4 minutes. 7. Add salt and turmeric powder. 8. Saute for another minute and add to the ground filling. 10. Keep 1 or 2 tblsp of the filling inside each cabbage leaf. 11. Roll them tightly and secure the edges with a clove. 12. Steam cook for 10 minutes and transfer to a serving plate. 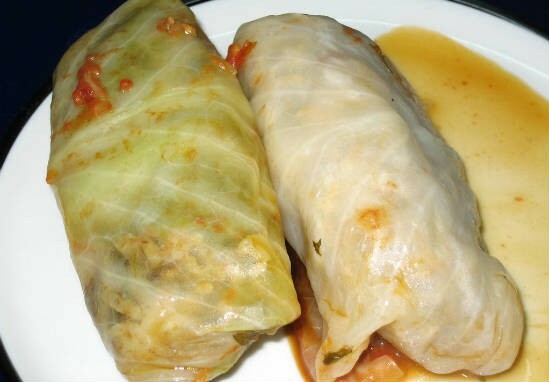 Feel free to comment or share your thoughts on this Stuffed Cabbage Rolls Recipe from Awesome Cuisine.